After being cooped up for the last couple of days, we busted out for lots of excitement today. We started out the morning with breakfast on the go and a community walk/run. Then we visited with a friend for a bit before heading to an antique car show (with delicious milkshakes). Best part of the day, by far, was reuniting with Chris after his week away. The boys were over the moon and so was I. 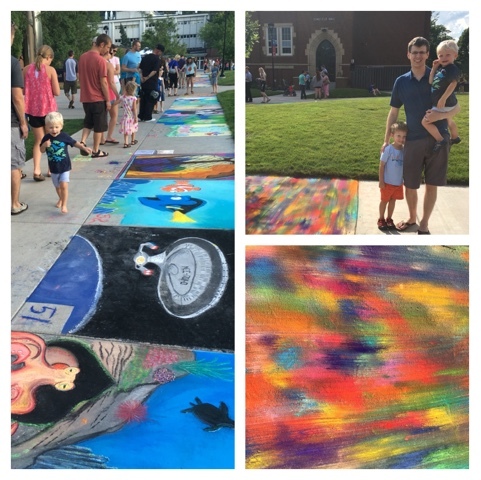 We didn't let him rest and relax from his crazy week, however, there was a local Chalk Fest at the university down the road and we had heard great things about this annual event. It definitely didn't disappoint. The creativity and talent of these 100ish artists was beyond inspiring. And what a gorgeous afternoon to be out wandering. We wrapped up the day by hosting my grandma and aunt + uncle for some fun conversation on our new patio. Days like today are 100% the reason we felt compelled to move back. It doesn't get much better.